Neither NASA nor the Space Coast can afford to stand still. We must be aggressive in pursuing the next generation of space exploration – and the jobs and innovation that will accompany it. That’s why the Obama Administration is pressing forward with its ambitious plans for commercial space and deep space exploration, and it’s why the agreement we’ve reached with the State of Florida to re-use our Kennedy Space Center facilities is so important. NASA has signed an agreement with Space Florida, the aerospace economic development agency of the state of Florida, to lease Kennedy’s Orbiter Processing Facility-3 (OPF3) to Boeing to manufacture and test the company’s Crew Space Transportation (CST-100) spacecraft. In addition, Boeing will be locating its commercial crew headquarters at Kennedy to take advantage of the center’s outstanding facilities and experienced workforce. The 15-year use permit deal is the latest step Kennedy is taking as the center transitions from a historically government-only launch complex to a multi-user spaceport, and it will help us retain and create jobs in the region. Today is a great day for NASA, Kennedy, Boeing, Space Florida, and the commercial space industry on the Space Coast. The Obama Administration has marshaled significant resources to the Space Coast region to strengthen NASA’s role in innovation and job creation. • Earlier this month we announced the selection of the design for the Space Launch System – the most powerful rocket ever to be built — that would carry astronauts into deep space. This new deep space rocket will be processed, stacked and launched at the Kennedy Space Center, supporting thousands of jobs in the Space Coast. • The next-generation deep space explorer, Orion, designed as a multipurpose crew vehicle to ferry astronauts beyond Earth orbit to the moon, asteroids, and beyond, will undergo final construction, integration, and eventual launch at NASA’s Kennedy Space Center. The work on Orion will support at least 350 jobs at the center. • The Mobile Launcher is being built at Kennedy to assemble, test, check out, service, transfer to the pad and launch future rockets. Just one of these launch vehicles will be NASA’s SLS heavy lift launch vehicle to transport the Orion crew exploration vehicle, its crew and cargo on missions farther into the solar system than we have ever gone before. • We’ve headquartered our Commercial Crew program at Kennedy, and just last week we reported that four companies involved in the Commercial Crew development program are making substantial progress toward achieving crewed spaceflight. Since signing partnership agreements with NASA in April, these firms already have completed nearly 40 percent of the milestones on their rocket designs to carry astronauts into low-earth orbit. One of the companies, SpaceX, testified before Congress last week that it has invested $500 million in its Commercial Crew program, a significant private-sector commitment to this emerging industry. The NASA-Space Florida-Boeing agreement is a major boost to the Florida Space Coast and another important signal of the Obama Administration’s support for the area, and for the future of human space flight. We can’t wait when it comes to creating jobs and building the space program of tomorrow – and we’re not. Right now at NASA, we’re writing the next chapter in our nation’s extraordinary story of space exploration. Partnering with private industry, we’re planning a mission to Mars and supporting America’s job creators as they take over transportation of cargo and crews to the International Space Station. As we take this next leap in space exploration, we’ll help create good-paying U.S. jobs and spur innovation and technology breakthroughs. Today, at NASA’s Glenn Research Center, we are focusing on the innovations and technologies derived from NASA research and partnerships in a forum with MAGNET and the Center for Automotive Research at The Ohio State University. The President has repeatedly stressed that the only way for America to win the future is to out innovate, out educate, and out build our global competitors. Those three goals have been central to NASA’s mission from the beginning. We continue to stretch the boundaries of science and the possible. Our collaborations with private industry are enhancing our ability to make the most technologically advanced spacecraft in the world to explore new destinations and take humans farther into space. Those journeys start with investments on the ground like the kind we are making in communities in Ohio. The future of science is on display right now in Baltimore. A full-scale model of NASA’s James Webb Space Telescope will be on view in front of the Maryland Science Center through Oct. 26. I had the opportunity to visit it today, and it is amazing. The Webb telescope will be the most scientifically powerful telescope NASA has ever built — 100 times more powerful than the Hubble Space Telescope. It is the next of our great observatories. It will find the first galaxies that formed in the early universe, connecting the Big Bang to our own Milky Way Galaxy. The telescope will peer through dusty clouds to see stars forming planetary systems, connecting star formation in our own galaxy with the solar system. The telescope is a complex program for which 10 new technologies had to be invented. All of these challenges have been conquered, including the capabilities that will be required for this huge instrument to be deployable, work at cryogenic temperatures, and maintain precise pointing and attitude control from its orbit approximately one million miles from Earth. That’s what we do at NASA. We create what doesn’t exist, to create and win the future. While most of our missions occur in space, the investments made–and the jobs created — to support these missions — happen right here on Earth. NASA has always been an engine for economic growth and job creation, and the Webb telescope is just the latest example. I was privileged to pilot the mission that deployed Hubble, and I am very excited about the promise of Webb. Science remains integral to NASA’s future, and just in the past months we’ve launched missions to Jupiter and the Moon. We’ll launch a new Earth-observing satellite later this month, and in November the Curiosity rover will be on its way to Mars. Those are just a few of NASA’s newest science missions, not to mention the dozens already in orbit around Earth, zooming across the solar system and peeling back the veil on the cosmic phenomena and other planets that are enormous distances from us. I know tomorrow’s science leaders and engineers will be inspired by the life-size Webb mockup. Just as Hubble re-wrote science textbooks, Webb will take us even farther on our cosmic journey. I hope you can visit, and when the Webb telescope launches, you’ll have a tangible image in your mind of just how incredible our newest great observatory is going to be. The power of education to transform lives, lift up communities and build pathways to a brighter future was brought home to me in a very personal way tonight during a visit to my hometown of Columbia, South Carolina. At the Richland County Public Library I was honored to present the Ethel Bolden Minority Scholarship to Gabrielle Marshae Dudley. Gabrielle is a young African American woman who has demonstrated outstanding community service leadership skills while pursuing a joint Masters of Library and Information Science and Master of Public History at the University of South Carolina. The Ethel Bolden Scholarship was established last year in honor of my mother’s more than 40 years of service to the Richland County community, its libraries, and its minority students. Being back in Columbia reminded me of the commitment my parents, who were both teachers, had to education. I guess you could say I got my passion for education honestly. And since becoming NASA Administrator in 2009, I have worked with our Associate Administrator for Education, Leland Melvin, to strengthen the Agency’s commitment to preparing the next generation for leadership roles, particularly in science, technology, engineering and math, or the STEM disciplines. We are committed to ensuring that every child, regardless of race, gender, ethnicity or background, has an equal chance to pursue and succeed in these fields. NASA’s partnerships with schools, universities and communities in every corner of this country is not only about keeping our own workforce pipeline fresh and flowing, it is also about ensuring that America will have the technical expertise needed to compete and win in the 21st century global economy. That is why STEM education is the foundation of NASA’s learning initiatives. But NASA needs more than scientists. We need researchers, accountants, writers, archivists, historians and yes, even librarians like Gabrielle Dudley. Ethel Bolden taught me as a child, “You need to know your heritage, where your ancestors came from, but you are part of a larger realm, part of a larger world.” As NASA Administrator, one of my greatest challenges and pleasures is helping to engage and inspire the next generation of Americans to explore that larger realm. Education is the vehicle that will take us there. Earlier today, I got a first-hand look at the future of space exploration during a visit to Florida’s Kennedy Space Center. The new 6.75 million-ton Mobile Launcher is one more tangible step on our path forward to launching deep space missions. When I was at Kennedy a little more than two months ago, I joined the dedicated team there in celebrating the achievements of our space shuttle program as it concluded an amazing 30 years of ground-breaking exploration and discovery. Since then, we have made great strides toward implementing the bipartisan vision agreed to by President Obama and Congress just one year ago. o We continued to work on the Orion spacecraft, the next vehicle in which astronauts will travel into deep space. o We’ve launched exciting science missions. o We expanded our agreements with our American commercial partners who are making great strides toward transporting cargo and crew to the International Space Station. o We’ve established a non-profit – located in the Space Coast – to manage the U.S. portion of the International Space Station. o We made significant progress on upgrading our ground-based operations here at KSC to support a range of launch activities, including commercial and deep space launches. o And we announced our plan forward with a Space Launch System, our heavy lift rocket. And today, we got to see the progress Kennedy is making with the new Mobile Launcher, which will be carried to Launch Pad 39B, a modernized clean pad that will launch those missions to the ISS and farther destinations. The Mobile Launcher is tangible evidence of our bright future and the critical path forward we are on to new destinations and new exploration achievements. It was built in large part by a Florida company, and it represents the jobs of the future as we continue to move toward reinvigorating Kennedy’s world-class launch capabilities. All around Kennedy, from the Operations and Checkout facility for the Orion multipurpose crew vehicle, to the establishment of a Commercial Crew program office to the ongoing science launches that regularly take-off here, it is clear the Space Coast is open for business and ready for a bright future. As we’ve ramped up our work on the Orion multipurpose crew vehicle, for example, we brought on more than 250 workers at the Operations and Checkout facility – bringing that number to more than 350 in 2012. This is also further proof that as our nation looks for ways to compete and win in the 21st century, NASA continues to be an engine of job growth and economic opportunity. From California to Florida, the space industry is strong and growing. The history of NASA is tied to Florida. The next generation of explorers will not fly a space shuttle, but they may be able to walk on Mars. And those journeys are starting at the Kennedy Space Center today. 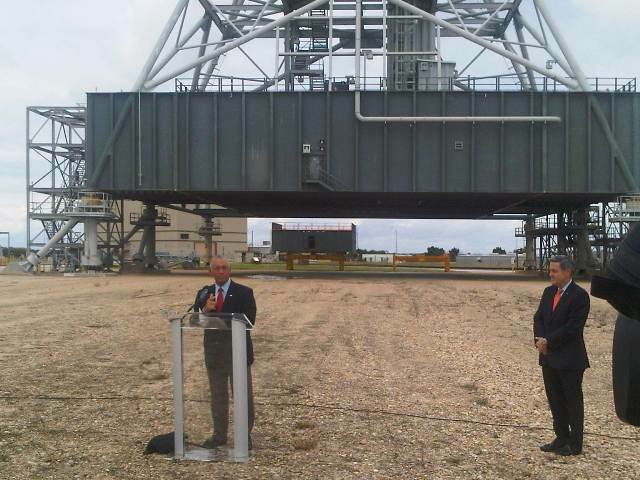 Administrator Bolden speaks in front of the Mobile Launcher at the Kennedy Space Center in Florida.